The present Satradhikar of SriSri Auniati Satra, Dr. SriSri Pitambar Dev Goswami was born on 14th June 1959 at Bijoymahora Satra in Duliajan, Upper Assam. 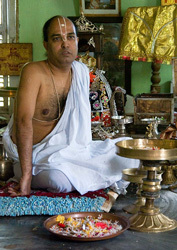 His parents, late Deva Kanta Dev Goswami and Srijuta Subhadra Devi belongs to the Bijoymahora Satra. Young Pitambar came to SriSri Auniati Satra as Govindapuriya in the year 1969 at the age of ten. During that time SriSri Hem Chandra Dev Goswami was the Satradhikar and young Goswami got his spiritual education and nourishment from him as well as the then Dekasatradhikar SriSri Bishnu Chandra Dev Goswami. His formal primary education started in the primary school of Auniati Satra at Majuli and thereafter he left to Guwahati for higher education. Staying in the cultural and spiritual environment on the bank of the Brahmaputra in the North Guwahati branch of Auniati Satra, young Pitambar completed his matriculation, higher secondary and bachelor degree from the Gauhati University. He then completed his Masters degree in Assamese literature from the same University as a private student. During these years Sri Goswami also acquired his Vyakaran Sashtri in Sanskrit language. After the baikunthaprayan (demise) of SriSri Bishnu Chandra Dev Goswami, SriSri Pitambar Dev Goswami took the nirmali as the 16th Satradhikar of SriSri Auniati Satra in the year 1998. After taking over as head of the Auniati Satra, Sri Goswami took number of projects to give a new direction towards development of the Satriya culture and Majuli. He revived the age old Dharma Prakash Yantra from where the second Assamese news magazine Assam Bilasini was published in the year 1872AD by his predecessor SriSri Devdutta Dev Goswami. He successfully invigorated the press with a new establishment in the same name of Dharma Prakash Yantra and published a quarterly magazine called Sanskriti Pallav in the year 2000. Under his able stewardship the Kaliapani branch of the Auniati Satra was established the in the year 2004. He also arranged the celebration of Santa Samaroh at this newly constructed venue to bring together galaxy of Santas, Satradhikars and Rishis for a greater cause of peace and humanity. In the midst of his busy schedule and activities Sri Goswami also completed his PhD degree in literature for his thesis on Satriya Utsavar Parichoy aru Tatparya Vichar from the Dibrugarh University. Dr. SriSri Pitambar Dev Goswami was invited to join the World Heritage Conference under UNESCO at Lijiang, China during October 2001 where he represented the people of Assam and Majuli and delivered a talk to bring the Satriya culture to the international level. Dr. Goswami has written more than hundred articles in different magazines and news papers and has eight dramas and over a dozen books to his credit.